70804 with 6O36 - 70815 70816 in consist. Whitemoor to Hoo Junction Engineers working. 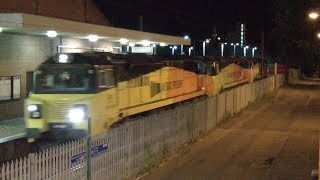 Caught on a mobile phone, Colas 70804 moves classmaters 70815 and 70816 from Whitmoor to Hoo Junciton in an uncommon triple headed move, although only '804 was powering. Seen here passing through Stevenage station.